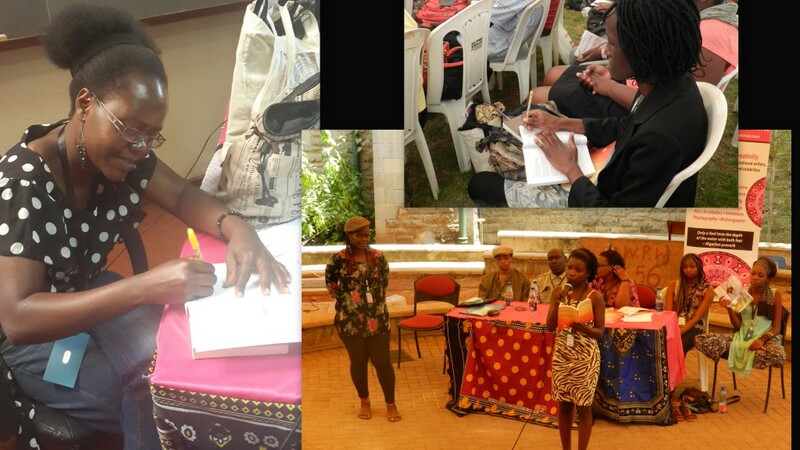 Just before I took off to Nairobi for the The Storymoja Festival, I attended some Babishai Niwe Poetry Award events. This year, the award was extended to the rest of Africa, having targeted Ugandan women for the previous five years. September 16 was BNPA’s award night, the search for Africa’s new voice finally coming to an end. The previous day, BNPA had launched the African Poetry Library and the shortlisted poets had visited the Femrite Readers/ Writers Club. I missed both events but I plan to visit the library soon and let you know about it. By now you already know that Tom Jalio (Kenya) won the award for his poem There Was Once Something Special Here. That night, a new anthology, A Thousand Voices Rising was launched as well. It was really wonderful to see previous winners of the BNPA poetry award recite their poems and there were quite a number of poets I had never even heard of! We can’t say people are not writing! A Thousand Voices Rising does not only feature Ugandan poets but poets from quite a number of African countries. I need a lot of patience when I am reading poetry so I can not give my review yet but if I must give you a reason to read this anthology (and this is very biased) all the ladies in my writing club are in there. I am the only one that is not a poet in the group but Davina Kawuma, Lillian Aujo and Harriet Anena have some great poems in there. You get a copy of the anthology at Aristoc or here and see for yourself. Harriet Anena and Davina Kawuma sign my copy of A Thousand Voices Rising, while Lillian Aujo recites her poem, Soft Tonight at The Storymoja Festival. Remember these names, people! The most interesting discussion of the day for me was the discussion on whether spoken word poetry is making written form old-fashioned. 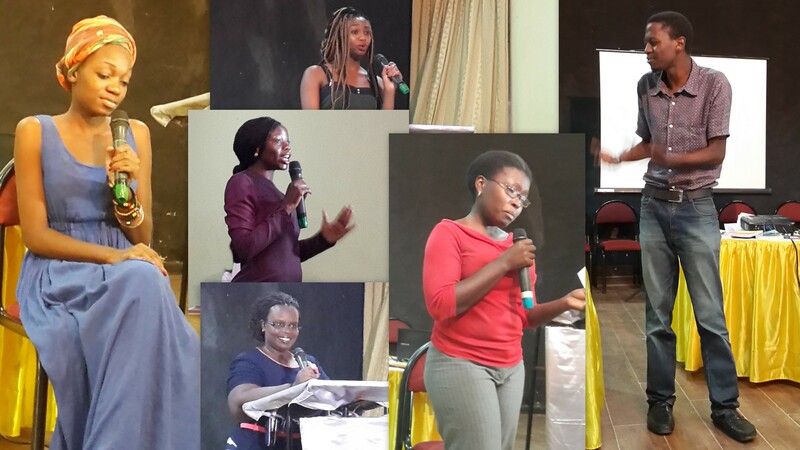 In the past couple of years we saw more and more poetry events become a part of the Kampala social calender. I remember in high school reading about a poetry night at Iguana (then called Wagadugu) and it read like one of those gatherings of pseudo-intellectuals trying too hard to prove that they were relevant. That event did not go on for so long. Years later, I attended Lantern Meet’s first poetry recital in that small, stuffy room at the National Theatre. The lighting was bad, the room was stuffy but we all agreed, nodding our heads enthusiastically, that the poetry was top notch. And then came Kwivuga (which I have heard will be coming back), Open Mic and Poetry in Session. We now know these spoken word poets by their voices, we root for them and sometimes we demand that they do the poems that we have come to love them for. Mention Jason Ntaro, Peter Kaggayi, Melissa Kiguwa, Roshan Karmali, Laura Byaruhanga and we say, of course we know who these people are. But is putting up wonderful recitals enough? Would publishing these poems add anything to what they have already? Most of the panelists agreed that both spoken form and written form are important. Patrick Mangeni actually pointed out that spoken word is not as new as these now flourishing recitals but that it goes back to our oral recitations of our great, great, great grandparents’ days. However most of us have no clue what stories our great, great grandparents told because they were not recorded, they were not written down, they were not immortalised. 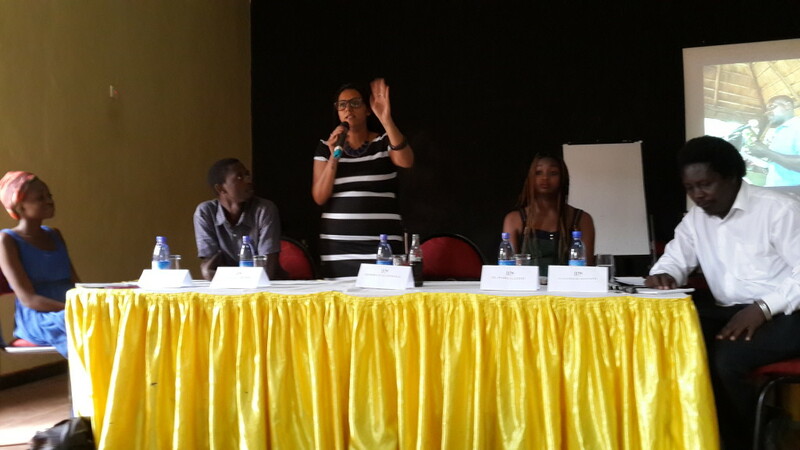 Panelists: Lydia Nyachiro (Tz), Peter Kaggayi (Ug), Roshan Karmali (Ug), Saba (Sudan/Kenya), Patrick Mangeni (Ug). So you say people have become lazy and they would rather have a production than read but what if we want to interpret these poems for ourselves, away from the performers’ interpretations, where do we go if they have not been written? My other concern was that whereas written form undergoes a lot of editing, all details paid attention to, spoken word does not. It is very easy for a performer to make you feel a certain way about a poem even though it may not be a good one. He can use music to change the mood, his voice, rising and falling to add meaning to what might not be meaningful. They can even use stage props and lighting to make you feel a certain way. Where the written form relies on the meaningfulness of the words to make it great, the performer employs all these other things. How then do we make sure even our performers are giving us great poems, poems that can stand alone as poems without any adornment? What are your thoughts on this? Is written form still relevant? Would you like to actually read the work of these spoken word poets that you love or are their recitals enough? Ps:The rest of the photos can be found on Sooo Many Stories’ Facebook Page. I’ve always preferred to read rather than listen to a poem (which must be because my poems are for the page and not the stage). Similar to what you said, I think spoken word is similar to music…..you can use many elements to make it more special and that’s great for entertainment.